Coenobita possess compound eyes comprised of faceted lenses which are especially adept at picking up fine movements. The eyes are located on movable stalks and this is one of the primary ways we determine the species of hermit crab we are looking at. 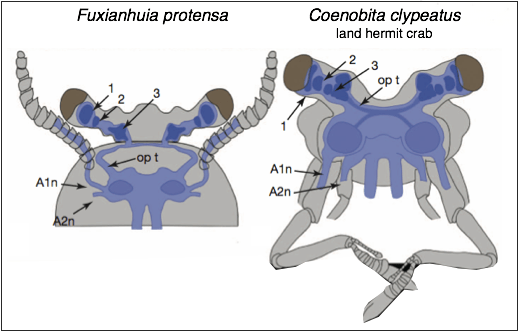 Reconstructed brains of Fuxianhuia protensa and land hermit crab Coenobita clypeatus showing homologies with Malacostraca. 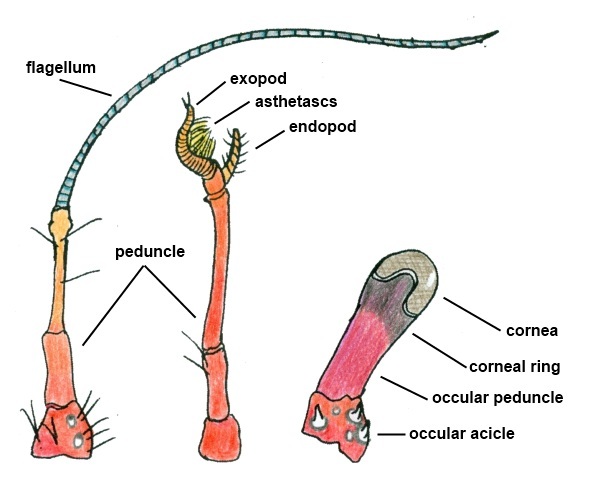 They share 3 nested neuropils in each eye stalk (arrowed 1-3), A1n (antennal nerve), A2n (second pair of nerve roots), op t (optic tract). The Crab Street Journal has been granted permission by these photographers to use their photo(s) on our site.